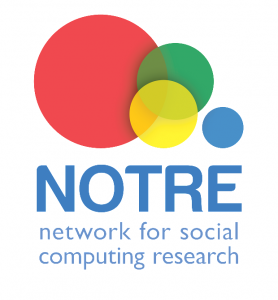 The kickoff event of the project titled Network for Social Computing Research – NOTRE (notre.socialcomputing.eu) of the Social Computing Research Center (socialcomputing.eu) of the Cyprus University of Technology took place on Monday, February 8th 2016.. The NOTRE project is funded by the European Commission through the Horizon 2020 Twinning programme – TWINN – 2015. The total project budget is 1 million euros and the duration of the project is 3 years (01/01 / 2016-31 / 12/2018). NOTRE project aims to develop a network that will strengthen and enhance the research and innovation potential and capability of the newly established Social Computing Research Centre (SCRC) at the Cyprus University of Technology (CUT) for stimulating scientific excellence and innovation capacity in the area of Social Computing. NOTRE proposes close network collaboration between SCRC of CUT and four internationally-leading scientific institutions FORTH-ICS, iMdea, MIRALab, and UDUS specializing in: (a) online social networks and their analysis; (b) entertainment, games, virtual reality and educational technologies; (c) Social Computing for social inclusion; and (d) Social Computing and social change. The establishment of such a network will boost the image of Cyprus as a research and innovation hub in the domain of Social Computing in Europe that is in relation to the Smart Specialization Strategy of Cyprus. For its implementation, the project brings together five partners from four countries: Cyprus (Social Computing Research Centre (SCRC)), Greece (Foundation for Research and Technology Hellas (FORTH-ICS)), Spain (Fundacion Imdea Networks (IMDEA) and UC3M), Switzerland (Universite de Geneve (UNIGE)) and Germany (Heinrich-Heine-Universitaet Duesseldorf (UDUS)). During the kickoff event all partners presented their institutions, personnel and aims, and discussed about the work plan and priorities of NOTRE. The project coordinator is Prof. Panayiotis Zaphiris from the Department of Multimedia and Graphic Arts o CUT. The local project team includes all the members of the Social Computing Research Centre: Angeliki Gazi, Vicky Triga, Νicolas Tsapatsoulis and Yorgos Zotos from the Department of Communication and Internet Studies – Andreas Lanitis, Andri Ioannou, Despina Michael and Antigoni Parmaxi from the Department of Multimedia and Graphic Arts – Michael Sirivianos and Fragkiskos Papadopoulos from the Department of Electrical Engineering, Computer Engineering and Informatics. New website for H2020-TEAMING-RISE project!